he protest has been going on for months now and turned violent on Tuesday when protestors were not allowed to march up to the plant. Agitated protestors then started to pelt stones and toppled police vehicles. 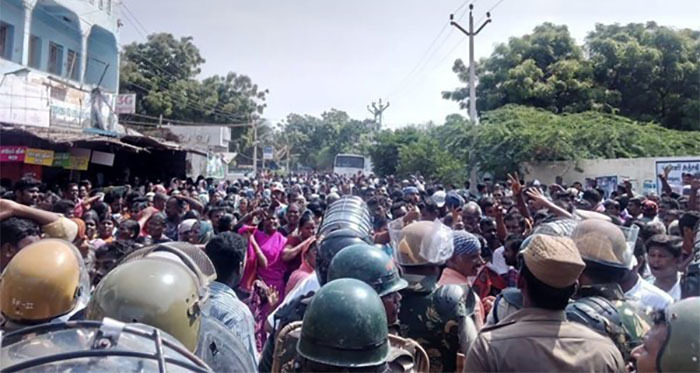 Tamil Nadu: Nine people have been killed on Tuesday during a protest held in Tamil Nadu's Tuticorin, demanding a ban on Sterlite Industries, in wake of the pollution emitted by the plants. According to initial information, nine people have been killed when the police opened fire and one is critical. More than 65 people have been injured in the clashes between agitated protestors and police officials. The injured people have been shifted to a nearby Government Hospital in the area. The protest has been going on for months now and turned violent on Tuesday when protestors were not allowed to march up to the plant. Agitated protestors then started to pelt stones and toppled police vehicles. The protestors also tried to gherao the collector's office and torched vehicles inside the premise. Police officials resorted to lathicharge and tear gas to disperse the crowd to contain the tense situation. Actor Rajnikanth also took to Twitter and slammed the AIADMK. He said, "Tamil Nadu Government's inaction is responsible for the violence in Tuticorin. Tamil Nadu Government should take the responsibility for the loss of life, and violence in Tuticorin."